*This con­sole includes the inter­nal Waves card but an exter­nal Waves Sound­Grid serv­er is required to use Waves plu­g­ins (please see our rental inven­to­ry for Sound­Grid serv­er options). The SD8 is a par­tic­u­lar­ly ver­sa­tile con­sole with the same Stealth Dig­i­tal Pro­cess­ing and float­ing point Super FPGA tech­nol­o­gy seen in the flag­ship SD7. The SD8 offers a tru­ly superla­tive per­for­mance at a com­pet­i­tive price, some­thing which will appeal to engi­neers across the board. 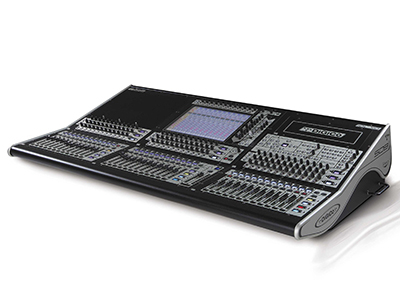 This SD8 (37-chan­nel ver­sion) boasts three banks of 12 motor­ized faders and one mas­ter fader. At the heart of each console’s work­sur­face is a 15-inch, high res­o­lu­tion TFT LCD touch screen with back­lit dis­play. Through this user-friend­ly inter­face, any bank of 12 faders can be instant­ly assigned as input or out­put chan­nels, allow­ing all 36 main faders to con­trol inputs if desired; equal­ly, any bank of 12 can also be assigned to the touch screen for fine-tuning. In addi­tion, the SD8 ben­e­fits from ded­i­cat­ed mul­ti-func­tion con­trol knobs and elec­tron­ic labeling. The SD8 boasts 120 input chan­nels at 48kHz/​96kHz. Stan­dard chan­nel pro­cess­ing, whether inputs or out­puts, includes Chan­nel Delay, Sin­gle and Mul­ti Chan­nel Pre­sets, Dual insert points, Hi- and Lo-pass fil­ters @ 24dB/​octave, four-band para­met­ric EQ with band curve selec­tion, DiGiCo’s DYN 1 (Com­pres­sor, De-ess­er or Mul­ti Chan­nel Com­pres­sor) and DYN 2 (Gate, Com­pres­sor or Ducker). The con­sole also ben­e­fits from 190 Dynam­ic EQ proces­sors, all of which can be assigned to any of the input or out­put chan­nels. These pow­er­ful proces­sors offer dynam­ic pro­cess­ing on each of the four stan­dard para­met­ric bands, plus there are also 190 Multi­band Com­pres­sors and 190 DiG­i­Tubes; and no mat­ter how the con­sole is set up, the user won’t lose any resources, as all the chan­nels are equipped to pro­vide the same high qual­i­ty sig­nal path and fea­ture set. The mas­ter sec­tion incor­po­rates 24 gangable 32-band graph­ic EQs, 16 stereo effects (selec­table from a palette of 33), and 24 con­trol groups (VCAs); and using snap­shots, engi­neers can now switch between com­plete con­fig­u­ra­tions in any live envi­ron­ment eas­i­er than ever before, be it at rehearsals, dur­ing sys­tem set­up, or even at a show. In addi­tion, DiGi­Co has includ­ed 48 busses, all of which are assign­a­ble as mono/​stereo groups or aux­il­iary busses; and in addi­tion to these busses, for fur­ther con­fig­ura­bil­i­ty, we’ve pro­vid­ed a 16 x 16 out­put matrix, dual solo busses, and a Mas­ter buss. Unlike all oth­er dig­i­tal con­sole man­u­fac­tur­ers, you don’t lose Aux or Group Busses when using the Matrix as they are in addi­tion, includ­ing the Mas­ter buss. The SD8 has plen­ty of local I/O: eight mic inputs, eight out­puts, eight mono AES I/O, and two MADI con­nec­tions. This con­sole also include the fac­to­ry fit Opto­core option which allows for con­nec­tiv­i­ty to all DiGi­Co racks and con­soles in a redun­dant loop via Mul­ti-Mode HMA Optics. As with all DiGi­Co con­soles, it can also con­nect to an SD-Rack, an SD-Mini, and SD-Nano Rack or even a MaDi-Rack, D or D2 rack.